The #1 thing to say about this brand is value. They aren’t our lowest cost trikes, but they are the most bang for your ‘bent buck. 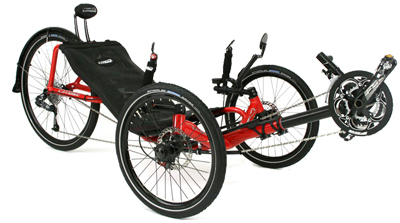 We usually keep all or most of the Catrike models in a variety of colors. We like selling Catrikes. You can compare a Catrike to a sports car. It delivers the same sort of satisfaction with the same sorts of compromises. In general, these trikes are lightweight and fast, with low seats and confident handling at high speeds. A Catrike can carve through corners and center itself on the straightaway. 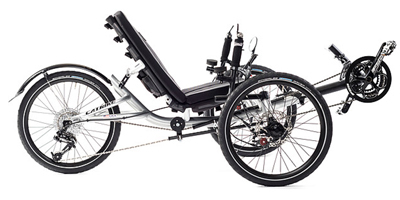 Catrike pioneered a rethinking of the trike steering. Their direct steering system, though simple in construction, uses a complex relationship between leverage on the handlebars, body position, and weight distribution on the front wheels that engages the rider with the machine. You connect with a Catrike in a stimulating way. 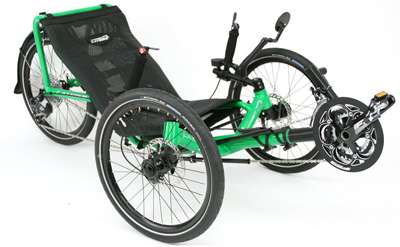 Catrike offers a wide variety of color choices, at no extra charge. They also come equipped with lots of accessories, at no extra charge. For their price, they are really well spec’ed in components. If you don’t know much about component quality then just take our word for it: there is a lot of value packed into Catrikes. All new Catrike frames come stock with a rear fender, wrist rests, charinring guard, reflective safety flag, headlight mount, computer sensor mount, mirror/computer mount and a mirror. Their mechanical disk brakes are the best on the market. Stock gearing is wider ranging than anyone else on the market. Their Schwalbe Marathon Racer stock tires are better than you’ll find on many trikes costing more. You can spend more on a trike, and there are many fine features on more expensive trikes, but no one puts as much value for the money in as Catrike. If you can convince yourself to fork out for one then do it! Big Cat HPV is the brainchild of Brazilian inventor Paulo Camasmie. In the late 90’s Camasmie began experimenting with the idea of the high performance comfort bike. He soon discovered this concept was already in full swing in the recumbent industry. So he packed up the family and came to the USA, where he began to meet the people in the business and turn out prototypes. Paulo’s hero, Alberto Santos-Dumont, in his airship #6, making a nuisance of himself in Paris, 1901. Big Cat pioneered several innovations. They were the first to make aluminum a practical material for trike frames. Also, they developed direct steering, now copied on models from Terra Trike and Sun. Their design is still the most refined, linking the rider’s subtle body motions to the control of the vehicle. They made use of the wheel and axle designs developed for downhill mountain bikes and made disk brakes standard equipment on trikes. Though the practice of integrating the seat into the frame was not new, Camasmie made some simple improvements and brought out the curvy, feline shape that the product’s name promised. Along with all that, Big Cat keeps production in the US. They build their frames, wheels, seat mesh, and all brand-specific components in the US, or else sourced from North American suppliers like TerraCycle and Arkel. Big Cat builds to order, with very little inventory sitting around. While orders may sometimes have to wait a few weeks during the peak of the season, we never have to wait for some ship to arrive. We’ve seen our orders built from scratch in less than two days. Since they paint their frames in house, Catrikes have far more color choices than anyone, and they make these options available on all their models. Big Cat is one of our favorite companies to work with.